Like regular lasagna, only better! It obviously tastes just like regular lasagna…but I love how they’re rolled into more individual servings. It keeps me from getting carried away and just piling on tons of pasta onto my plate. It also cooks faster than stacked lasagna, which is great. This particular recipe calls for chopped chicken too. I’d never had chicken in my lasagna before, but I really liked it! I think I actually prefer it to ground beef or sausage like you so often have. 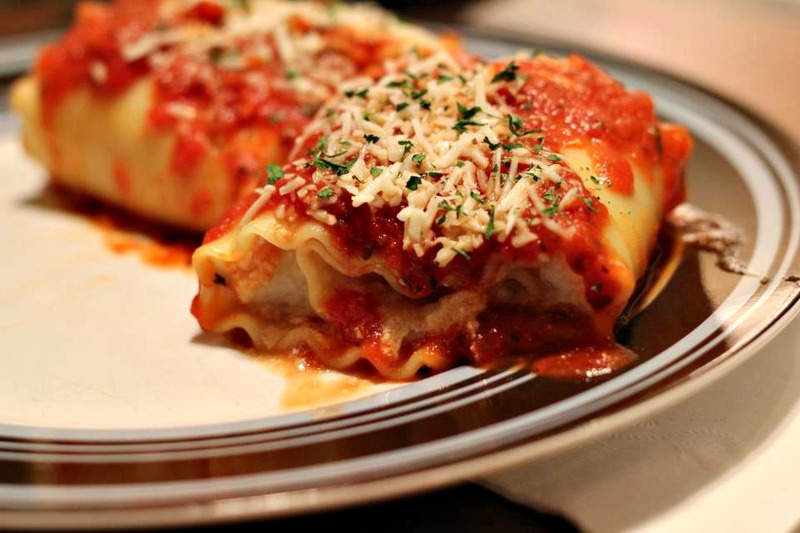 And of course, you can leave out the meat and have a delicious vegetarian lasagna roll-up too! In medium bowl, combine chicken, cheeses, milk, and pepper. In a 13 by 9-inch baking dish, spread 1 cup spaghetti sauce. Arrange lasagna rolls, seam-side down in sauce in baking dish. Top with remaining spaghetti sauce. Cover and bake for 30 minutes or until hot. If desired, serve with additional parmesan cheese. Quick and easy Most recipes make too much This way I like Just a few noodles for how many is eating and yumm Thanks for sharing. You’re so right! Most lasagna recipes make way too much, and this is the perfect solution Thanks for reading and liking my post!